Williams called it the ultimate machine which it probably was in its time. 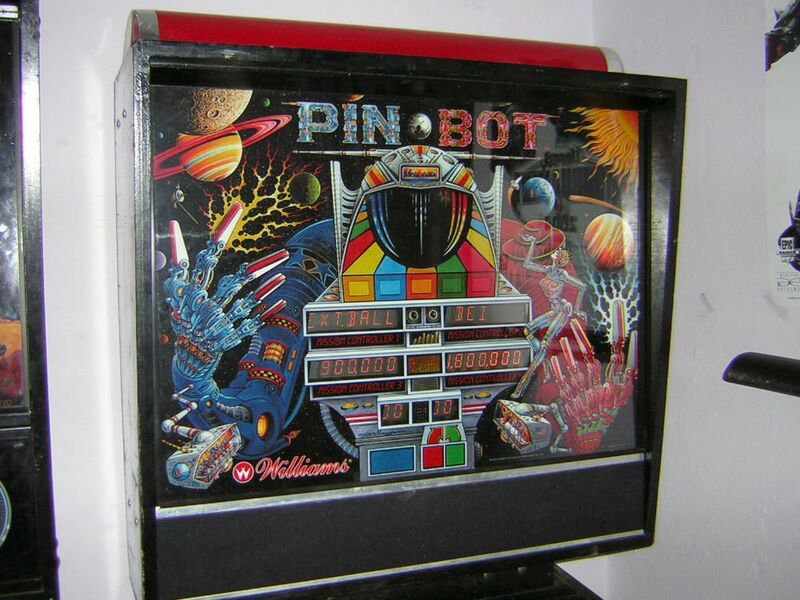 Pin*Bot was one of the games that brought the attention back to pinball after it had been over-shadowed by the video arcade games. Many people love it just because it was so unusual back then and has a cult factor today. Actually there are also video game adaptions of Pin*Bot on the Nintendo Entertainment System and one or two stand-alone hand-held games. As I described on the Space Station page, I traded it with Peter for his Pin*Bot which was now more attractive to me than when I had seen it the first time. And the idea of getting The Machine's husband, the original game which she was built after, was quite nice. First they stood opposite of each other, now they stand next to each other (because of Terminator 2) like a loving couple. So why did I take Pin*Bot even though I didn't want it first? Because a) it was the only decent offer for my Station and b) I learned to like this game. In fact, Pin*Bot does not really give you the classic old-school feel that I looked for when I first thought about buying an older game. However, since that idea failed anyway, a mid-80s game with some old-school flair but unusual design that fit next to The Machine and had a lot of rules? Sounded like a perfect compromise and so I took it. Now Pin*Bot stood where the Station used to be, and it got played every day by numerous people from then. Peter had removed the backbox again like he did with The Machine, but since he did the driving this time, he assembled the cabling in the backbox for me using his experience as an electronic technician and some reference sheets he drew earlier. So, this time the assembly really consisted of the standard procedure of leg screwing and moving it into the right place. Turning the game on gave it an instant run. Peter told me he exchanged two of the displays some time ago and underpowered the voltage (from 100 down to 80) so they would work a few more years than with normal voltage. He had also bought the head flashers and plastic top separately after he got the machine without it. This head part starts flashing when certain events happen, similar to F-14's rotating dome lights. Pin*Bot is a robot that can speak only a few sentences with a distorted voice. He (it) attempts to control the universe including all nine planets of our solar system and the sun in the center. 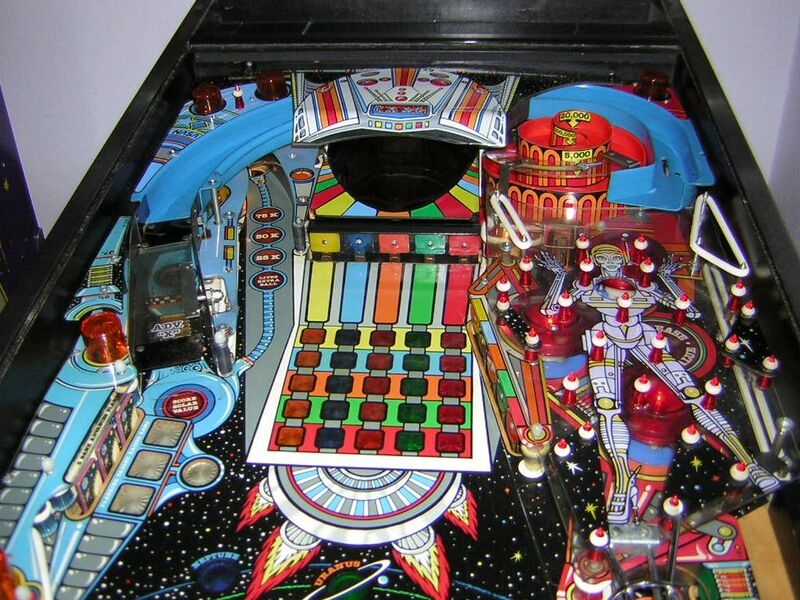 Obviously he was built and is monitored by many astronauts on the playfield and backglass, similar to The Machine. The goal of the game is to open the visor of his helmet and make him see. It's a first step that The Machine completed by making her speak, see, and live. The theme is visually carried by a playfield that is mostly black and has a lot of white dots (stars) on it, so it's clearly a space-themed pinball - and was therefore a good follow-up to Space Station. You have the nine planets and the sun as lamp inserts, shaped like a vortex on the playfield center, and those planets can be lit when playing. 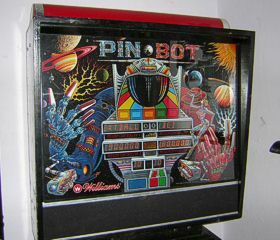 At the top of the playfield is Pin*Bot's head with the black visor and helmet on it, and the whole playfield is sur-rounded by his arms that go down along the sides, ending at the bottom where the flippers are. Actually the artwork goes under the flippers and makes it look like he is moving his fingers when you flip. Otherwise there is the mini playfield that is an exact reverse of The Machine's mini playfield: while it has Pin*Bot on it there, it has The Machine, Pin*Bot's bride here, though in a stylized 80s fashion that looks more like a robot than a woman. Of course they didn't know at this time that they would be making a pinball game about her in the 90s! Audio in Pin*Bot is atmospheric. Sound effects are a little spaced out and sound typical for the old sound system Williams used in '86. 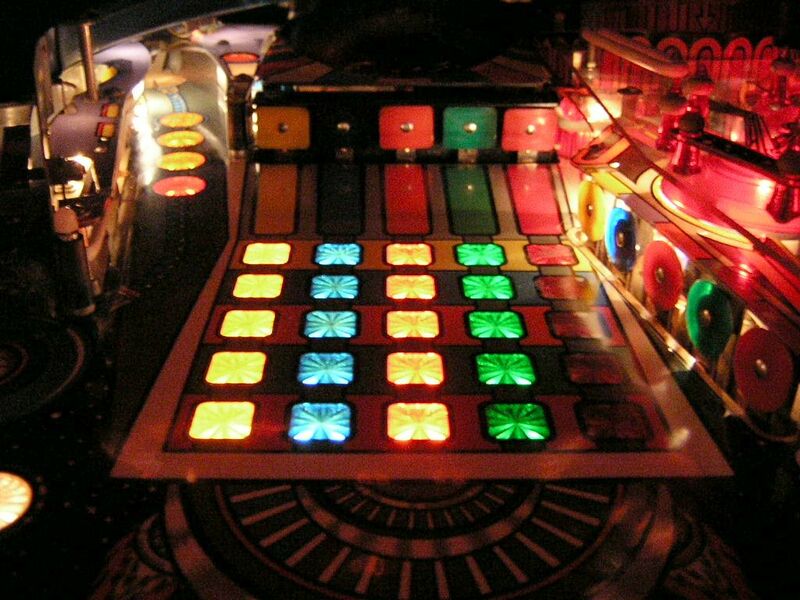 The music sounds dark and electronic, a little aggressive until multiball starts. The well-known Pin*Bot music theme is played in multiball and sounds essentially happy and successful, and this theme was later reused in The Machine when the ball enters the mini playfield (the "Pin*Bot area") and also in Jack*Bot as the main theme. Jack*Bot is the third game in the Pin*Bot "series" which combines him and his bride in a casino-themed game, however the playfield is exactly the same as Pin*Bot's. Pin*Bot might seem simple, but as I mentioned above, it has a few more rules that make it one of the classic 80s games not to get boring. I can still play it today after beating the highscores and I feel it's still worth playing. For one, you have something like a main goal which is to hit the three timed drop targets that advance the planets. If you manage to get to the planet that was selected by the game, you get a special. You get another special if you make it to the sun. 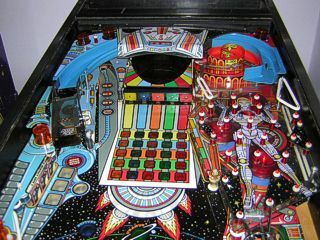 And finally there is the multiball mode which requires an open head to get started. Opening the head is possible by shooting at the light matrix targets in front of the closed head to light all lamps on the 5x5 matrix, then the head opens and you have to lock two balls in the eyes. Now Pin*Bot sees you, ejects the balls and requires you to re-lock one ball in an eye and the other to be shot up the ramp in a limited time for Solar Jackpot. 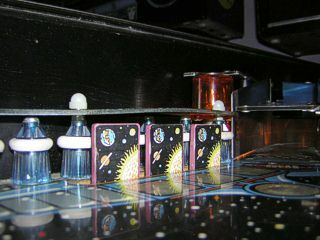 The jackpot can be anywhere from 100,000 to 5 million and is advanced by shooting the ramp in normal non-multiball play. The unfair thing is that the jackpot value is carried over from game to game, meaning if you had 50 games with a lot of ramp shots but no multiball where the jackpot was redeemed, it will be quite high and the next player that manages to redeem the jackpot gets the value that other players created in their games. The bumpers see quite some action especially after the skill shot. This is similar to The Machine's skill shot since you have to estimate the power of the plunger when you shoot the ball into play so it falls into one of the vortex holes that give a great value. Simply shooting with full power into the top of the vortex is lame, just like The Machine where a full shot through gives you only 25.000 points. Pin*Bot's gameplay is very good for beginners since the game awards extra balls and specials very easily and it also has a drain post in the center between the flippers. However, just like his wife, Pin*Bot tends to have the ball draining through the outlanes. It does have the same extra ball lane change feature in the out- and inlanes that The Machine has, so if you lit Extra Ball, you might get it when the ball drains. Since my Pin*Bot is probably one of the best around, I didn't do much except cleaning it (it was dirty alright) and exchanging lamps and rubbers. 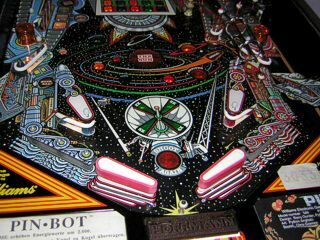 The mylar is still very good and was even polished by Peter, so the playfield looks awesome. Plastics are all intact except for one tiny break that was taped next to the ramp, and the only disturbing wear spot is behind one of the bumpers, but since these are hidden under the mini playfield, you cannot see it normally. If I sell this machine, I can be sure to get about 350 Euros as I estimated myself and was also told by forum members. There is only one little bug which must be due to a malfunctioning contact I haven't found yet: some-times the game tilts even though nothing happened. The funny thing is that it cannot be any of the three tilt switches since they don't tilt the game without a warning, but exactly this happens. Maybe the future owner will find out about this. Yes, because I plan to sell Pin*Bot soon even though I didn't have it for too long. Granted, I like the game and it's not something I would sell if I had more space. However, after I had it and played it for some time, I found it was a good game but I wanted MORE - a third machine, Terminator 2. Now that I have it, I learned for myself that I am indeed more of a WPC fan after all since both the restored Machine and T2 give me a lot more fun, entertainment and long-time playability than Pin*Bot does, which has been left standing turned off next to The Machine now. I even sacrificed one of his flipper plungers to repair a broken plunger link in my T2, so Pin*Bot is unplay-able right now, and it doesn't matter to me. Maybe my phase of wanting an early electronics machine from the 80s is over? 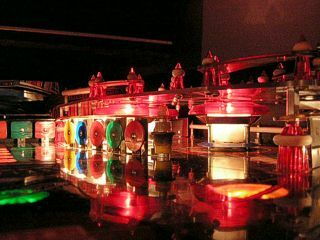 I still feel very interested and eager if I see a Xenon or a Space Shuttle on photos or in Visual Pinball, but I would not buy any of those right now with so little space. If I can have only three machines, those three must offer first-class entertainment no matter from what age they are. And this has led me to say that there are a few machines I would sell my Pin*Bot for. And such a machine is currently on eBay and I keep my eye on it because it's probably the only opportunity to get it in a long time. It's a Black Knight 2000, and no other 80s pin stands against that one, not even Pin*Bot! So, if it works and I get the Knight, the Bot will have to go. It's a loss to me, but for a big gain, bigger than even The Machine in terms of collector's value. Update, 27th March 2005: Pin*Bot was sold in November to a collector in Berlin who had been looking for a Bot for a while, and I got Black Knight 2000 instead. 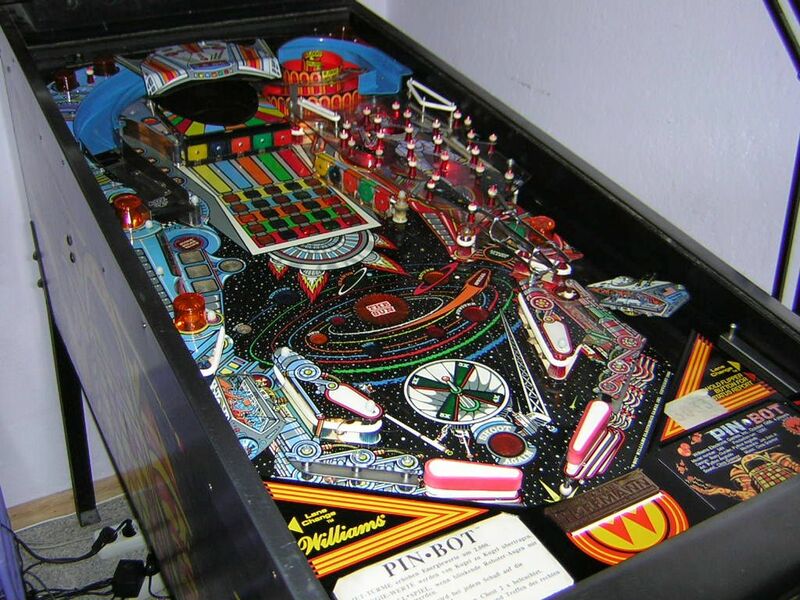 I still think that Pin*Bot is a great game especially for a 1986 machine, but I would not want to trade any of my machines for one again - it is simply not the best game for me. The Internet Pinball Database link has pics and info. If you want to play Pin*Bot on Visual Pinball (updated, very good conversion), download the table from VPForums (registration required).